Compare multiple competitors on screen at any one time. View a replay of the race, with coloured dots moving across the map simulating a mass start in line with the actual split times. 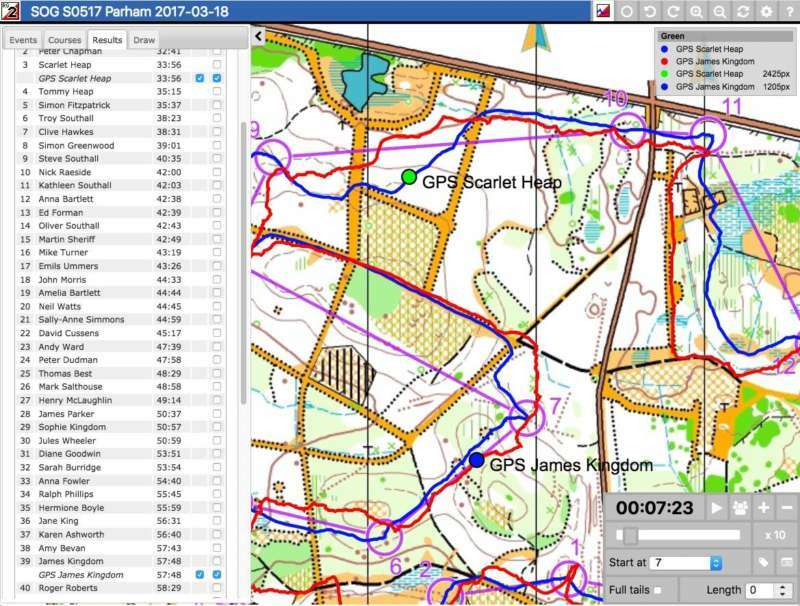 View maps and courses from all over the world (good preparation before visiting a new area/country). If you have a GPS, you can upload its recorded track to RouteGadget. It adds another dimension to post-race analysis. Analyzing other people’s route choice is a good training aid. Analyzing your own route is a good training aid. Planners get feedback on how legs that they had visualised in their head, actually materialised. It provides added value to an event. Can it be used for Coaching? Quote from Nick Barrable: “You could certainly do so much more feedback and coaching back in the warm and dry by the PC, especially with developing athletes”. Coaches can view their athletes’ performance and route choices from a distance & provide feedback. If used in conjunction with a GPS, you can see where they really went rather than where they thought they went. Let them plot their route from memory then load in the GPS track and then compare them on screen together. The Southdowns RouteGadget is hosted on the RouteGadget UK site along with most other clubs. This is the new version of RouteGadget that has been developed by Simon Errington of Happy Herts. You can read more about it and watch video tutorials about how to use it on the RouteGadget UK website.